Dead Rising: Chop Til You Drop for the Nintendo Wii is not a game for members of the press. It's nearly impossible for us to look at the game objectively after spending countless hours playing the highly superior Xbox 360 original. It's like reading War and Peace and then trying to fully appreciate the Cliff Notes version. It can't begin to approach the level of polish, complexity, and the overall experience of the original, plus your friends might laugh at you if they catch you buying it. As I sat in on a hands on session with the title, I could see by the expressions on my peers' faces that no one seemed to be all that impressed. No, Dead Rising for the Wii is for those folks who haven't owned a 360, haven't been steeped in Dead Rising press releases, news stories, previews, and reviews over the past couple of years - basically folks that don't read our website all that much. With that in mind, let's look at what's changing in the hobbled version of Dead Rising.Dead Rising: Chop Til You Drop uses a modified version of the engine for Resident Evil 4, so it might do the title a little more justice to consider it a Resident Evil parody rather than associate it with the original game. The change of engines modifies the entire feel of the game, giving it a more slow and plodding feel that its predecessor. You aim with the Wii remote, shoot with the trigger, and can either hit a button to initiate melee attacks or charge up your melee weapon by shaking the remote in order to unleash powerful special for more powerful strikes. The gun because much more important in the Wii version, as special melee maneuvers require that you stun your opponent with gunshots first. Even the lovable servo heads require a gunshot first, ruining the fun of running about willy-nilly tossing plastic heads all over the place. In order to maximize resources, Capcom had to sacrifice weapons. Any weapon that had a similar function as another has been condensed into one. This helps performance of course, but in exchange you lose the feeling of immersion you used to receive from being able to pick up nearly anything and use it as a weapon. Of course the number of zombies on screen have been reduced, with the small demo level we experienced never showing more than a dozen zombies at a time, though they have upped variety a bit with the inclusion of evil poodle enemies and rare enemies like the electric police woman from the original game making her debut as a standard enemy. There are some positive changes though. Overtime mode is unlocked from the get, go, and you no longer have to juggle side missions with your main objectives now that all of the side missions are required, a fact that Capcom PR thought might even make the game something players of the original might want to play through. Pretty sure they're wrong there, but the thought was nice. 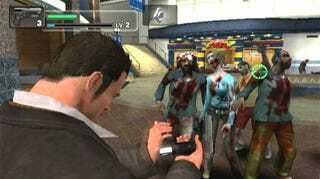 Dead Rising: Shop Til You Drop might be one of the best zombie-shooting games the Wii has ever seen, but unless you've never been exposed to the original game you you might find some of the cuts a bit too deep.